A U.S. Air Force F-22 Raptor assigned to the 90th Fighter Squadron at Joint Base Elmendorf-Richardson, Alaska, taxies on the runway at Royal Australian Air Force Base Tindal, Australia, Feb. 13, 2017. Twelve F-22 Raptors and approximately 200 Airmen are at RAAF Base Tindal as part of the Enhanced Air Cooperation Initiative under the Force Posture Agreement between the U.S. and Australia. The last wave of F-22 Raptors from the 90th Fighter Squadron at Joint Base Elmendorf-Richardson, Alaska, arrived at Royal Australian Air Force Base Tindal Feb. 14, 2017, to launch bilateral exercise and training missions with the Royal Australian Air Force and further strengthen the military relationship the two nations share. 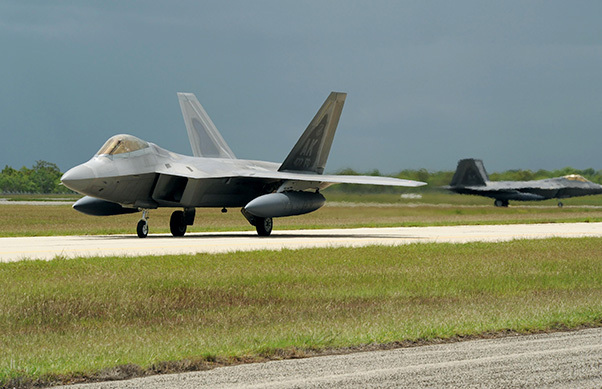 The F-22s, 12 in total, came to RAAF Base Tindal under the direction of U.S. Navy Adm. Harry B. Harris, the U.S. Pacific Command commander, as part of the Enhanced Air Cooperation Initiative under the Force Posture Agreement between the U.S. and Australia. This combined training activity marks the most extensive F-22 joint training with Australia in duration and scale, providing the Raptors the opportunity to conduct integrated air operations training with the RAAF’s 75 Squadron F/A-18A/B Hornets. A member of the Royal Australian Air Force marshals a U.S. Air Force C-17 Globemaster III, arriving from Joint Base Elmendorf-Richardson, Alaska, on the flightline at Royal Australian Air Force Base Tindal, Australia, Feb. 13, 2017. The F-22s and F/A-18A/Bs will conduct offensive and defensive training missions at various locations in the Northern Territory and Queensland. Skalicky explained the history of the 90th FS and how it can trace it’s lineage back to World War II when the then U.S. Army Air Forces 90th Bombardment Squadron conducted missions out of the area against the Japanese in various battles throughout the Pacific. “We were here 75 years ago, and to be back carrying on the tradition is an honor,” Skalicky said. 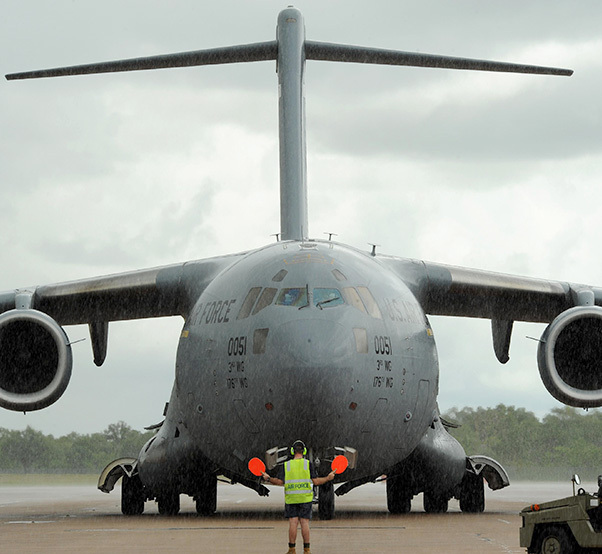 Accompanying the F-22s here are approximately 200 Airmen providing operational, maintenance, logistical and security support. The F-22s are scheduled to be in Australia through the beginning of March.